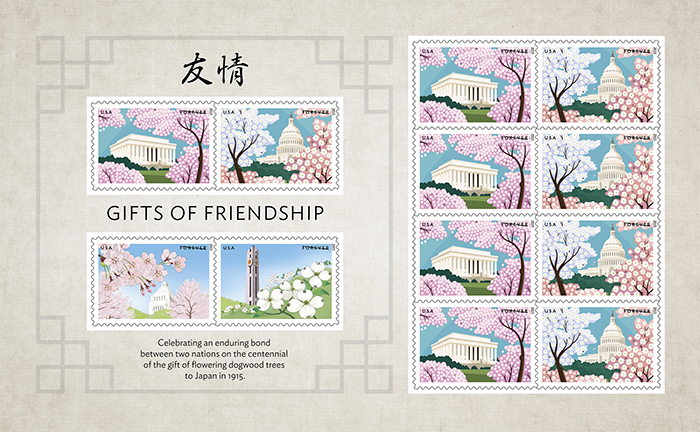 On Saturday March 24th, I’ll be in Washington DC for the First Day of Issue Ceremony for The Cherry Blossom Centennial postage stamp. In 1912 a gift of 3,000 cherry blossom trees was given to DC by Tokyo, Japan, the trees have survived the test of time and serve as a reminder of international friendship, blooming every spring the trees are also a symbol of the fleeting nature of time, and the fragility of life. The legendary art director, Phil Jordan asked me to work on this design, and the stamp really designed itself. 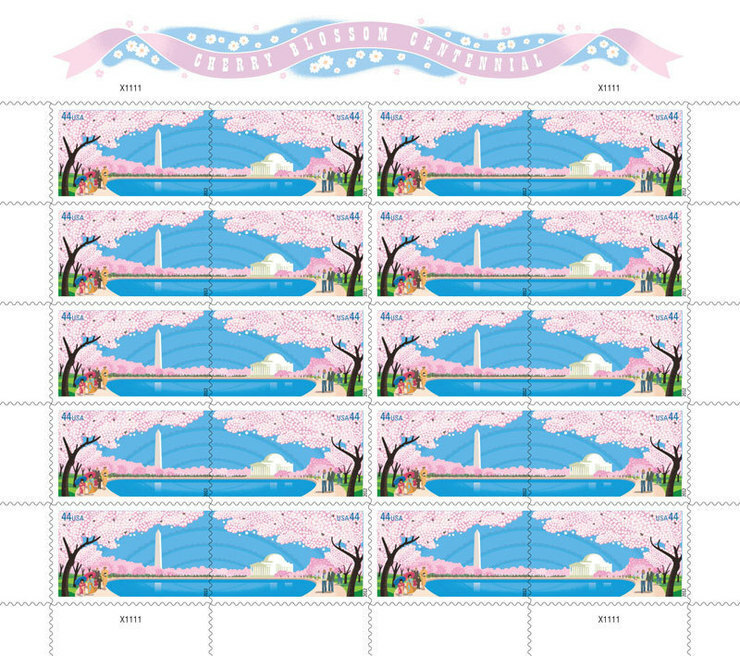 The format is “se-tenant,” a design that runs an image over two stamps, and it seemed like the obvious solution was a panorama of the DC tidal basin ringed with trees in bloom. 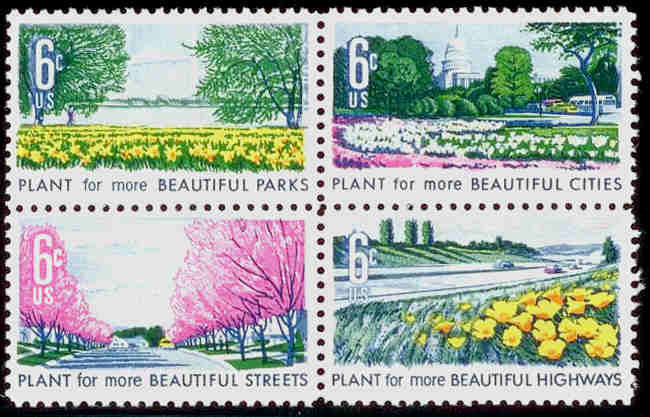 I did some research into past stamps and found a nice series from the 1960s called Beautification of America, and felt that a classic approach like that would be best. My job was to design a modern, clean addition to this tradition. There’s no shortage of artwork that depicts the trees in full bloom. Each year there’s an official poster for the Cherry Blossom Festival, (this year it’s done by one of my earliest art heroes, Peter Max) and the challenge was to come up with a fresh image. I have a warm spot in my heart for DC, because my daughter, Alex, did her under-grad at George Washington University, and is now in her second year at GW Law. It’ll be great to have her at the ceremony on Saturday, and I’m looking forward to meeting the philatelic enthusiasts who come out for these events. 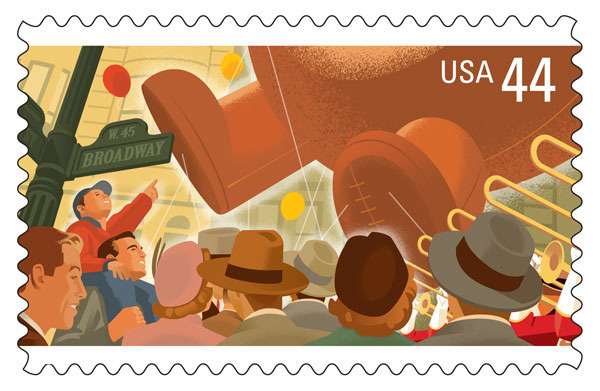 The United States Postal Service is previewing stamps from the upcoming 2012 program on their website beyondtheperf.com. 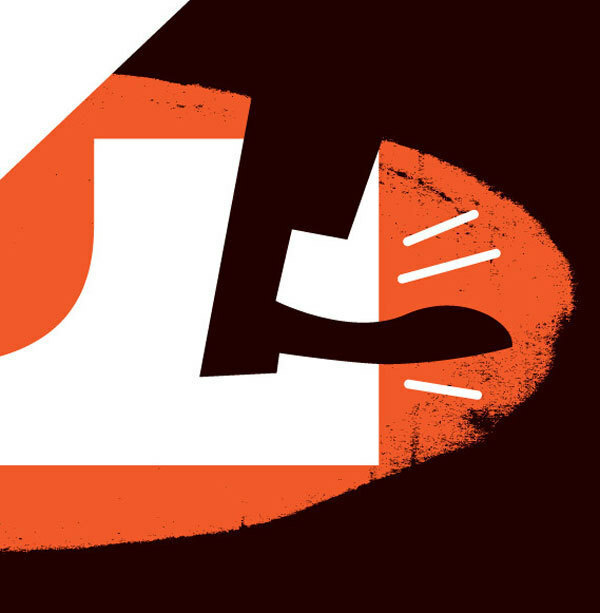 There's some great designs by Louise Fili, John Mattos, Craig Frazier, and Jim McMullan. I’m very happy to have two stamp designs included. 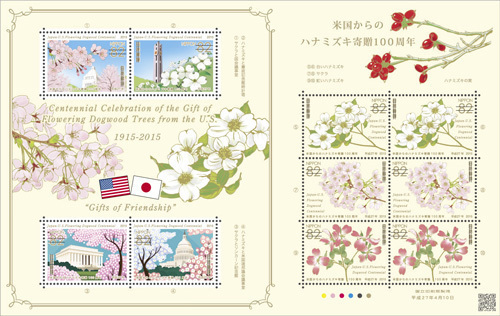 The first is the Cherry Blossom Centennial Stamp commemorating the anniversary of Japan’s gift of 3,020 cherry trees to the city of Washington, D.C. In March of 1912 the first two trees were planted and in 1927 local citizens held the first celebration of these trees. 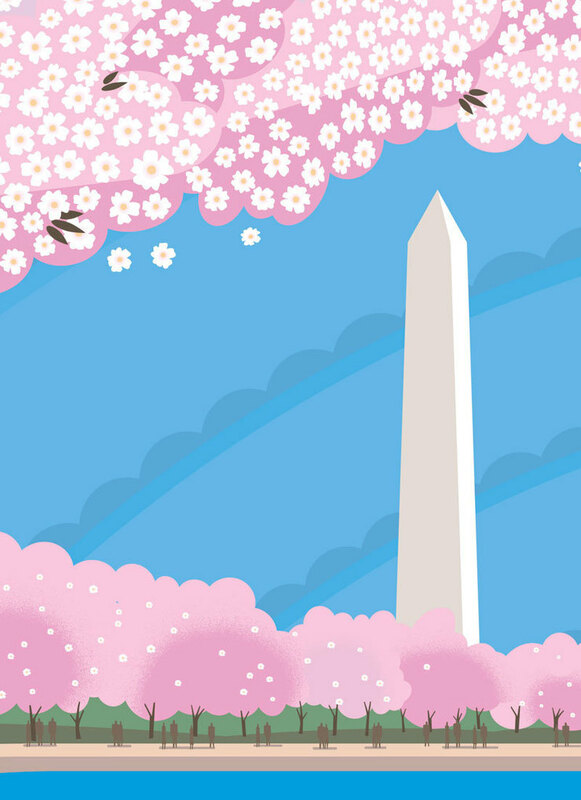 Today, the National Cherry Blossom Festival draws a million visitors each spring. USPS art director Phil Jordan gave me the assignment of capturing this panorama of spring on two stamps. Throughout history there have been a lot of stamps depicting our nation’s capital, and the challenge on this one was to make an image that fit that tradition and also had a fresh modern feeling. And, I had to figure out a way of dealing with all those cherry blossoms. 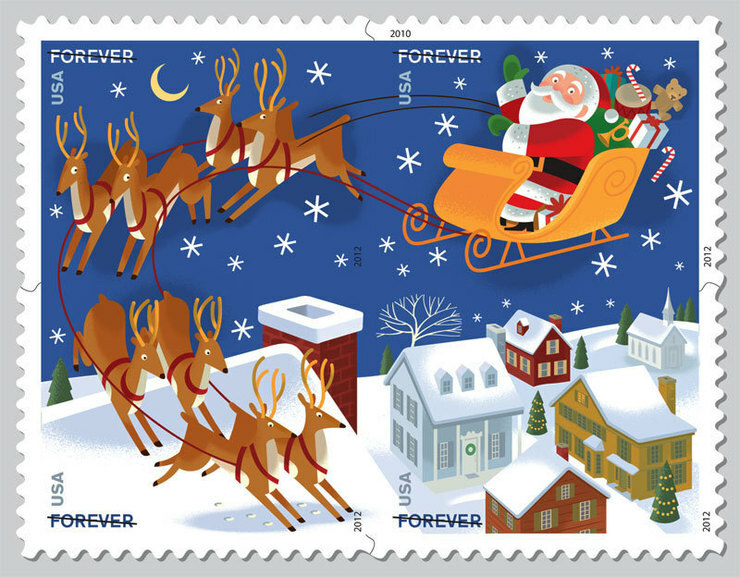 The second stamp being issued in 2012 is a Holiday stamp featuring Santa and Sleigh, another subject that has already had a lot of designs produced over the years. 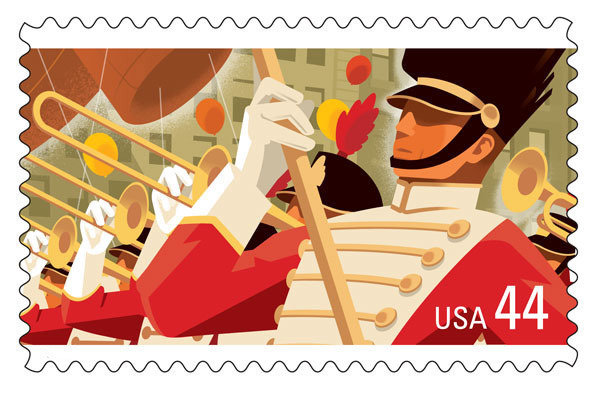 I worked with art director Howard Paine on this one and when he called about a Christmas stamp I cringed a bit because I was worried about how to approach this corny subject without making it look corny. 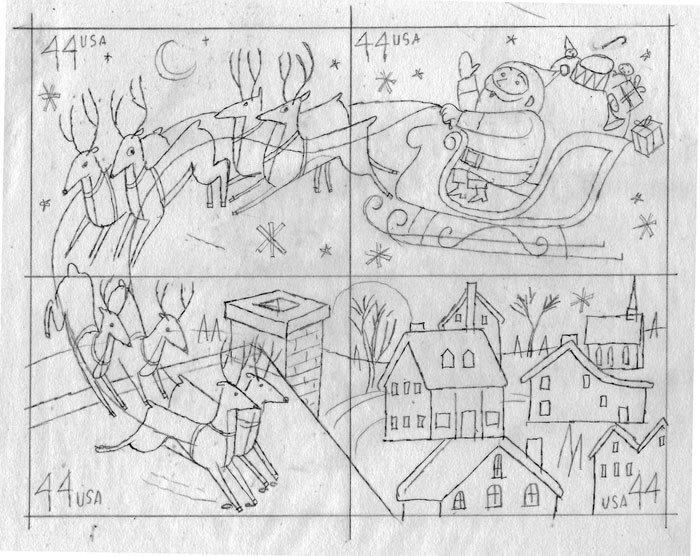 I took a look at the holiday stamps from the past and also drew on my memories of Christmas picture books from my childhood. This design had to work over four stamps as a complete image and each individual stamp had to be a satisfying design when used alone. It’s always an honor to be asked to design postage stamps, and the entire process is a pleasure, from the first sketch to the first time a piece of mail arrives at the studio with a stamp I designed on it. 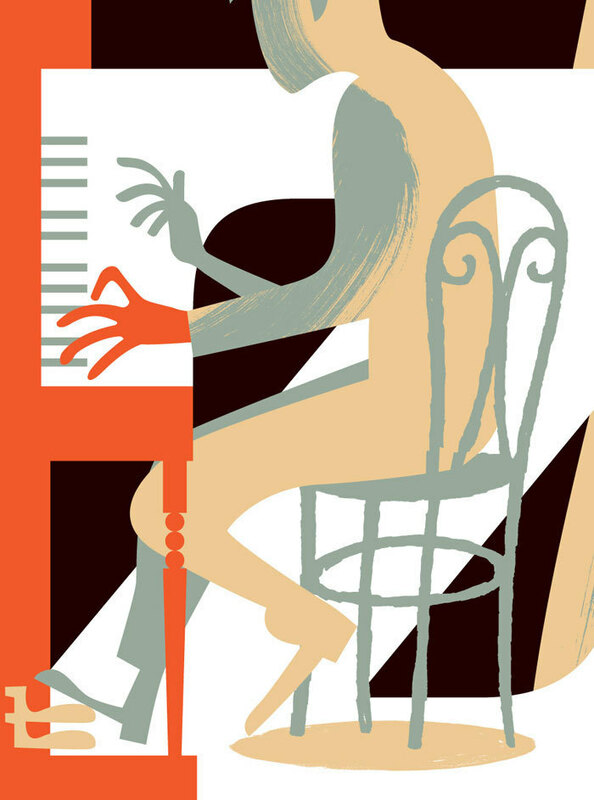 We’ll have to wait for 2012 for these two new designs, in the meantime, Jazz Stamps are still available. 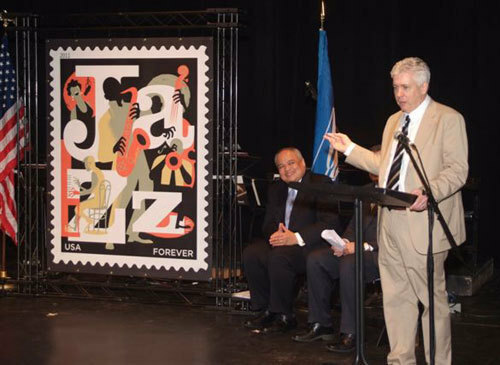 The USPS held a First Day of Issue ceremony for the Jazz Commemorative Stamp in New Orleans on Saturday. 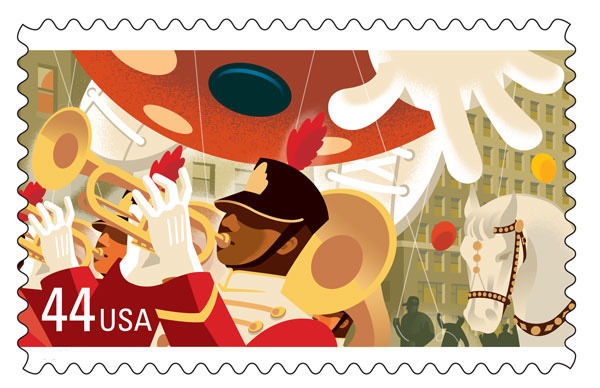 It was an honor to be asked to design this historic stamp to pay tribute to jazz music and a double honor to attend the ceremony in the Crescent City. In attendance were Guy Cottrell, chief postal inspector, Nancy Marinovic. 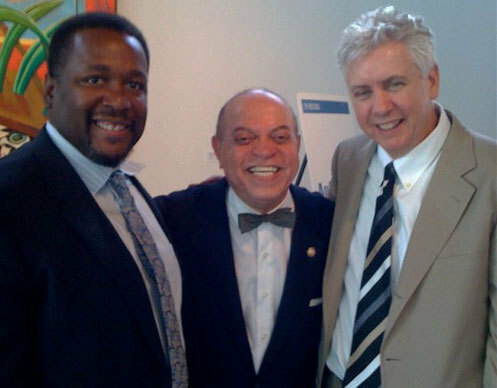 president of the New Orleans Jazz & Heritage Foundation, Jeffery Taylor, manager of the Louisiana District Postal Service and Thurgood Marshall Jr.. vice-chairman of the Postal Service Board of Governors. 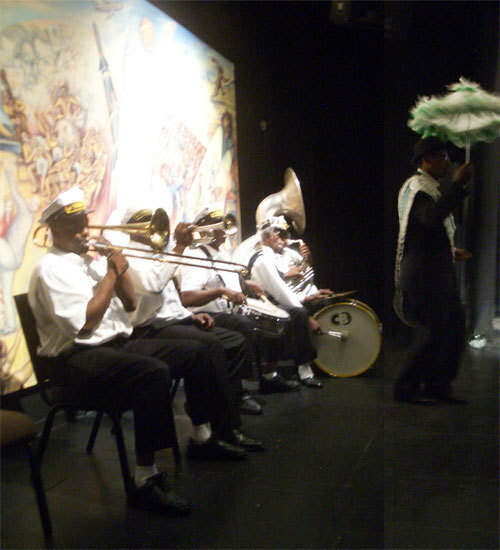 We were in the good hands of the Treme Brass Band, who played with the feeling that only bands from New Orleans posses. Adding to the honor, the legendary New Orleans musician Deacon John, and the heart and soul of the HBO show Treme, Wendell Pierce came out and everyone involved signed posters and First Day Cancellations of the stamp. Art Blakey said “Jazz washes away the dust of every day life” and maybe this stamp can wash away a bit of the dust in our everyday lives. They only printed 50 million stamps, so get down to your post office soon. 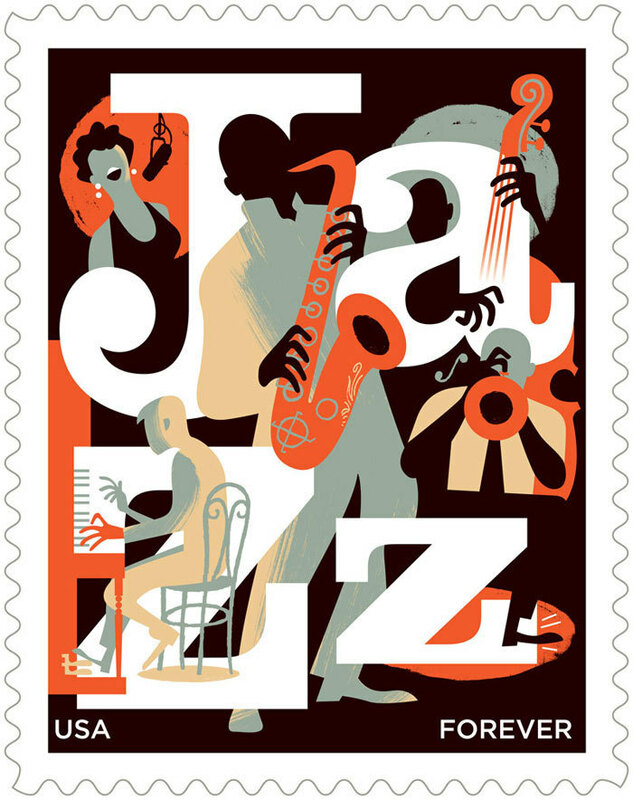 One day last year the friendly voice of Howard Paine was on the phone asking me if I’d like to design a jazz stamp for the US Postal Service. 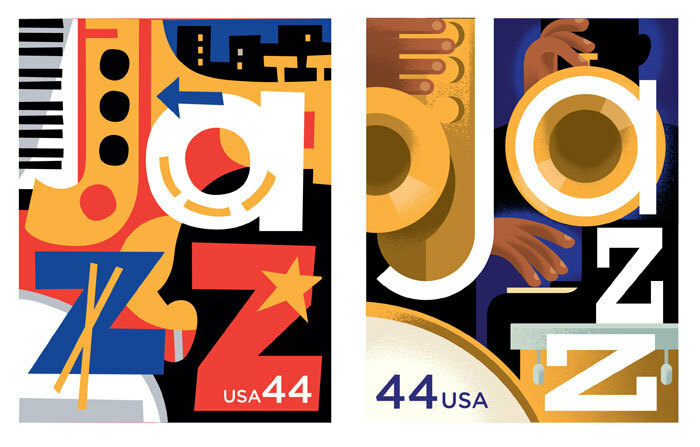 Louis Armstrong, Jelly Roll Morton, Duke Ellington, Charlie Parker, and about a dozen others have been honored with stamps in the past, and in 2008 Michael Bartalos designed a wonderful Latin Jazz stamp, but there has never been a single stamp to pay tribute to America’s original art form, jazz. It’s always an honor to design a postage stamp, and because I love jazz and have great respect for the history of the music, this one was very special to me. 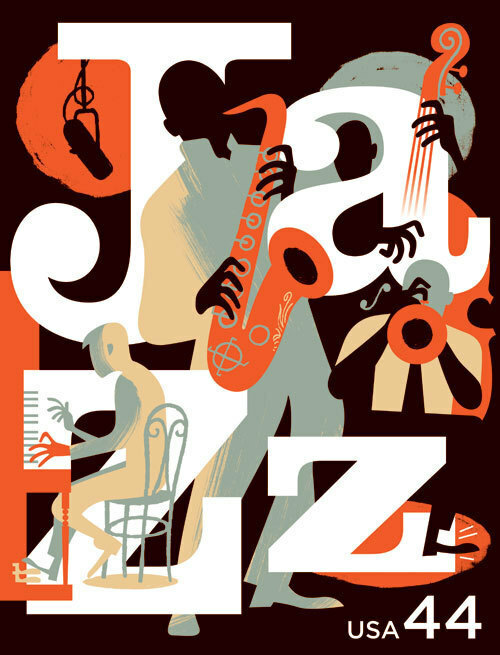 I started by thinking of all the artists I admire from the past who have created visual art with connections to jazz. I was going to have to rise to the occasion and deliver a design that would sit well in my mind with those images, or I knew I’d feel bad about it for a long time. David Stone Martin did hundreds of record covers throughout the 1950-60s. The design on the left was a big,big influence on my thinking for this one. 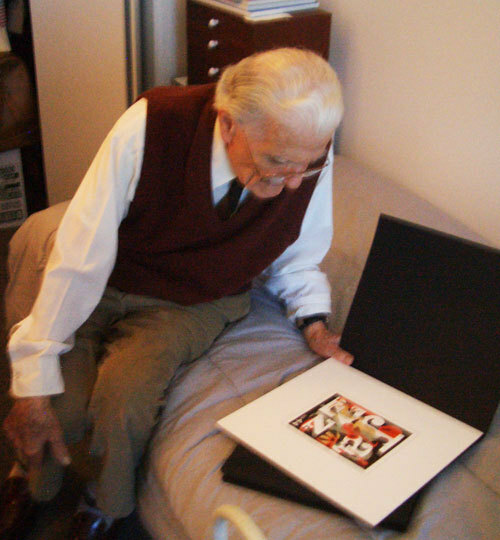 The legendary Alex Steinweiss invented the album cover and created thousands of designs for Columbia Records and others. 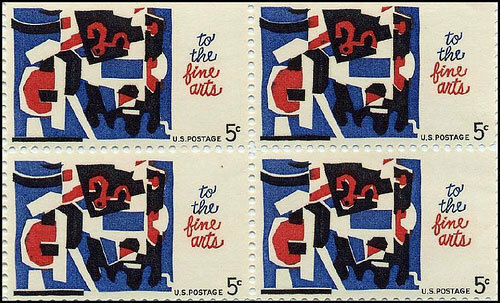 My favorite American painter Stuart Davis knew how to make a painting swing, and he made this 5-cent stamp in 1964 to honor the fine arts. The only requirements Howard gave me was that the letters J-A-Z-Z appear in the design and that no recognizable performer be depicted. Beyond that, he left it in my hands as to how to communicate the feeling of jazz. I thought that the best way to proceed was to design three stamps and show them as completed designs. If I took three different approaches, I might improve my chances of getting the Stamp Advisory Committee to approve one, and by taking each design to a finished stage I could refine all the elements to a level that I’d be happy with and would eliminate any guesswork in the approval process. 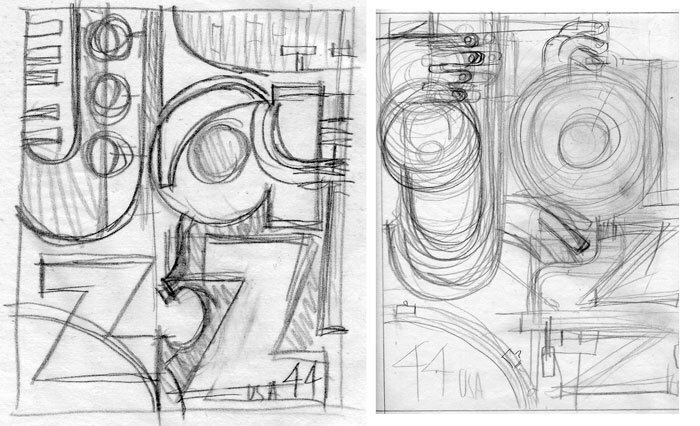 The first sketch carries a lot of Stuart Davis’ influence with a red, white and blue palette and abstracted instrument shapes mixed into the letter-forms. 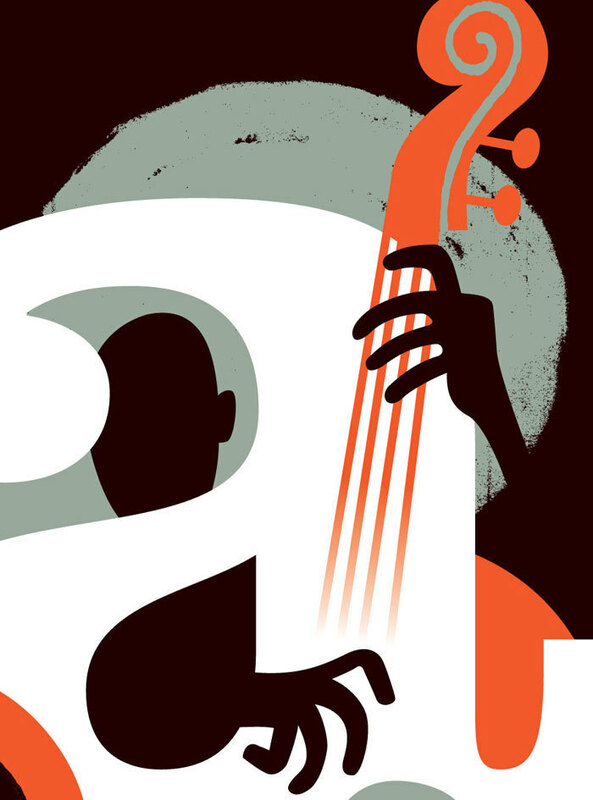 The second design takes a more geometric approach to the letters-and-instruments idea and includes some musician’s hands. A lot had to be worked out before this idea could be shown. The third design was the one that I felt best about, and it was the one I most wanted to be chosen. It shows a combo hard at work on the bandstand or recording studio. 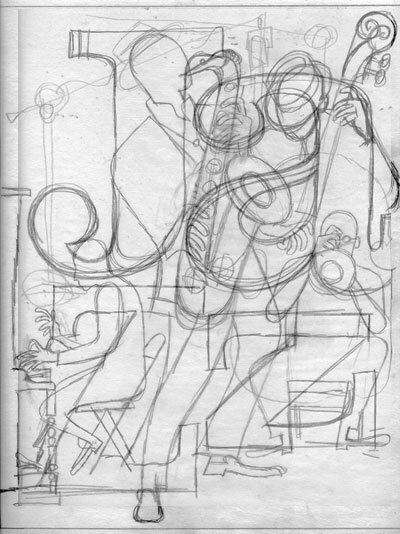 The big challenge was in the interplay between the letter-forms and the drawings of the musicians. A limited palette of orange, black, grey, tan and white carried the feeling of a late-night scene without getting into too much detail. It turned out that design three was approved very quickly with only a couple of small fine-tuning suggestions and a request to add a female singer into the scene. 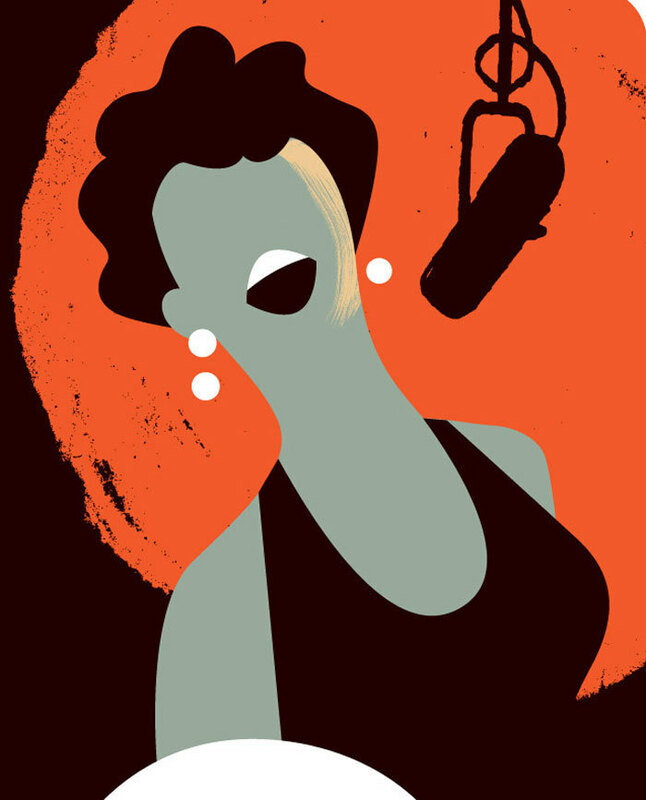 The singer could have been a problem, it’s not always easy to add another element to something that has been so worked out, but I was able to add her to the top left corner of the design. Also, 2011 is the first year that all stamps will be “Forever” stamps, so the word "Forever" replaces the 44-cent number. From a design standpoint, I’ll miss the graphic element of a numeral in the designs, but it makes economic sense for the customer and the USPS. I had the opportunity to show the design to the great Alex Steinweiss when I visited him last year in Florida. I laid a top-secret test-print on him while I was finishing up the project. 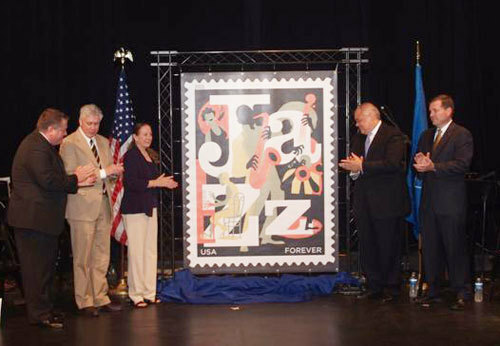 The stamp will be issued in March 2011with the official ceremony in the birthplace of jazz, New Orleans. 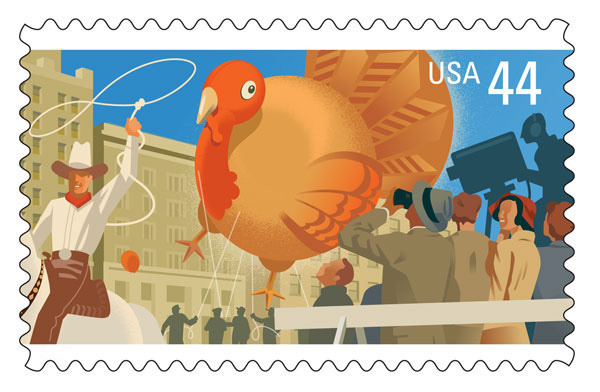 On September 9th the Postal Service will issue a series of four stamps I designed that feature a Thanksgiving Day Parade. Howard Paine was a pleasure to work with on this, he’s been the art director on over 400 stamps and he hasn’t lost any of his enthusiasm for producing great stamps. He had the idea for four stamps to fit together to create one long scene, a format that stamp collectors call “se-tenant.” Of course, each individual stamp needs to stand alone as a complete design as well. These stamps are the first I’ve done for the USPS and the project was a challenge for a number of reasons. The concept was to show the famous Macy’s Thanksgiving Parade, but for legal reasons, we couldn’t show any licensed characters or any direct reference to Macy’s Department Store itself. No recognizable balloons; that meant no Underdog. The most iconic images from the parade had to be suggested by selective cropping and careful positioning to give an accurate feeling of the parade without showing any specific balloons. We decided that the best way to achieve this was to depict a scene from around 1950, an era before the corporate images began to dominate the visual display of the parade. That time period also gave me a direction to think about in terms of illustration style. Mid-century posters and advertising often show a very complicated scene that is handled in a style that deals with the essence of form and doesn’t get hung up in detailed rendering. Fortunately Howard liked the first sketch I sent him, and that was important because I didn’t have another idea how I’d solve this one. I added color to the second stamp in the line so everyone at the USPS meeting would have a clear idea were we were headed. The legendary illustrator Tony Sarg was responsible for the design of many of the early characters in the parade, and for a number of years these balloons re-appeared in every parade. The other mandatory elements to be included were crowds lining the streets, marching bands, horses, and New York City buildings as a backdrop to the whole thing; your basic illustrator’s nightmare. One of the toughest parts to working on stamps is that you’re not supposed to talk about the project until the issue dates have been officially announced by the USPS. My aunt asked me recently what I was working on, and I told her I was doing some work for the Postal Service. She thought that work had slowed down for me and I was delivering mail.